The shelves in her cupboard were adorned with gleaming and ornate ittar and perfumes bottles, hers was a family steeped in olfactory pleasance. Since childhood the world of scents was the world Rahat knew well. The ittar connoisseur shared her mother’s fondness for all things fragrant. However, I am not going to talk about ace perfumer’s repertoire. I won’t discuss the fact that Rahat Khan does both procuring as well as blending to craft ethereal alcohol-free fragrances that please the senses and are easy on the skin. I won’t focus on the fact that she single-handedly established her brand ‘Fragrances By Ambrin’, without any previous experience in the field of perfumery or business for that matter. Instead of focusing on the above, I’ll introduce you to the side of Rahat Khan that I have identified as a true SHERO – I’ll acquaint you with a woman who chose to generate employment for fellow-women who had been dealt a poor hand by destiny. I’ll shine a light on the fact that she’s a woman who pushed the boundaries and built a business while keeping harmony in her family life and taking care of her children. I’ll pour my heart out to tell you about a woman who only believes in counting her blessings and has no intent to emphasize the challenges she met on the way. Before we get to the Rahat of today, let me walk you through her childhood. Since her early days, Rahat had an infallible nose, she understood aromas and blends very well. As she grew up her love for ittar deepened. However, making a career of her passion wasn’t in the stars yet. Things took a turn when she had her son. She was posed with a momentous life decision where she had to make a choice between taking care of her little one and stepping out for work. Rahat being the ingenious genius that she chooses to find the grey between the black and white. She decided to pursue a career that allowed her to work on her terms, manage majorly from home, be her own boss and define her timings herself. A business idea was conceived in her mind and her heart knew what had to be done. The time had come when the master perfumer started creating her very own kaleidoscope of aromas and so ‘Fragrances By Ambrin’ was born. It didn’t take her long to find the right blend of notes that would delight the youth, excite enthusiasts and appease ittar aficionados. Things were looking good, yet Rahat felt something was amiss. In an in-depth tête-à-tête with Rahat, I tried to understand what was the missing piece in her puzzle. Rahat had decided to employ women from the nearby slums to stitch, embroider, pour and package ittars for her. She visited the nearby slum area and met with women who took an interest in earning a living through stitching, pasting and embroidery work. The best part was Rahat didn’t expect them to rebel and step out of their house to work for ‘Fragrances By Ambrin’. These women were offered the liberty of working from home and it was a win-win situation for both the kind benefactress and the destitute women. The women came on board with much ease; one of them was employed by Rahat for domestic help. Rahat noticed that she had skills and was street smart. In a heartbeat the perfumer extraordinaire had her quit cleaning jobs and got her on board to be at Exhibitions with her. Rahat’s old cook who stopped working because of her old age used to stay at Jaitpur! She and her daughter-in-law do basic stitching for the ittar pouches. Rahat also distributes the printed bags for having Doris and the thank you tags put on by girls from nearby slum area. She has few girls who do that and they also do pasting on the bags. Rahat had no formal training in perfumery, just a good nose, and understanding of what notes usually last longer! The learning curve was steep, tons of ittar was discarded as it did not turn out as expected and she made many many errors before things finally started falling into place. The discarded ittar wasn’t disposed of instead it was filled out and distributed as one of the ladies had a child who goes to a far off village with a Madarsa! Today, Rahat possesses basic knowledge of how to differentiate a good blend and good quality. She understands what would make the notes pull longer, what’s good weather to wear what and what’s a good time to mature, what they are blending. From suppliers to courier guys, she has forged good bonds everywhere. Having reached great heights of success Rahat still holds on to her humility. When asked about the challenges she met on the way, surprisingly, she can’t name any! She counts her blessings and forefends the mention of the hardships she had faced in establishing herself in a male-dominated business. I had the pleasure of sampling her aromatic marvels; I am admittedly crushing over the cute and adorable khadi bags hand-crafted by her wonderful team! 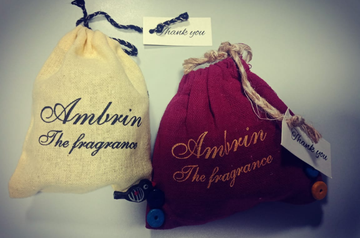 I am also compelled to say that ‘Fragrances By Ambrin’ tells an aromatic story that lingers a lifetime and touches the right heart notes. I met Rahat at Jashn-e-Rekhta in Delhi. Her collection was great and her passion for her work would leave a lingering impact on anyone she meets just like her perfumes.